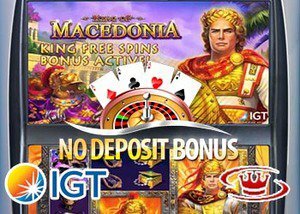 The new King of Macedonia slot has been released and we have an exclusive IGT no deposit bonus for all our readers at Guts Casino to try out this new slot. The new King of Macedonia slot from IGT has been released and is proving to be very popular indeed. This new video slot is based on the famous historical character, Alexander the Great of Macedonia, and is available to play now at all IGT casinos. What's more, we have an exclusive IGT no deposit bonus for all our readers. This is a 5 reel, 40 payline slot with a 96.10% RTP. It is suitable for all budgets with spins starting from as little as 0.80 and going up to 400 per spin. It is based on historical figure Alexander the Great and the symbols all relate to the theme as well and include Queen Olympia and the horse Bucephalus as the two high paying symbols. Other symbols include a helmet, scroll, harp, and ceramic pots. The scatter is a golden shield and can only be found on reel 1. When the scatter appears winning combinations that are formed come with a 10x multiplier. Alexander the Great is the wild symbol and can be found on reel 2, 3, 4, and 5. The wild is expanding and will cover 2 full reels wherever they land. There is a free spins bonus round that can be triggered by getting a wild symbol and a scatter symbol in the same spin. When this happens, you are rewarded with 8 free spins and the wild stays locked in place for the duration. This can lead to some great wins and there is huge potential. If this sounds exciting, be sure to check out our exclusive IGT no deposit bonus below. Get our exclusive $5 Guts Casino no deposit bonus when you use our link to sign up for a new real player account. You can use your free cash to test out all the great games risk-free and when you decide to make a deposit you can claim their fantastic welcome bonus of $300 plus 100 free spins. The welcome bonus is spread out over your first four deposits at the casino and works out as follows. The free spins are awarded immediately after your deposit using the specified bonus codes and in order to claim the bonus offer the minimum deposit amount is $20. There are further terms and conditions and wagering requirements and these can be found on the promotions page of the Guts Casino website.